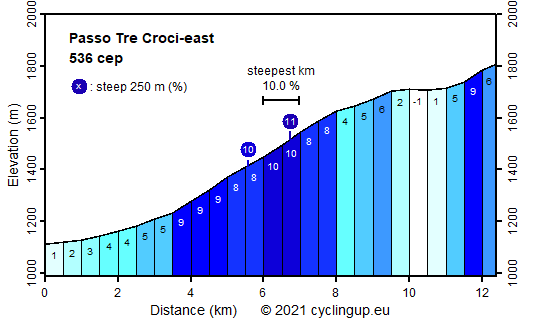 The first part of this climb to the Passo Tre Croci is identical to the first part of the southern ascent to the Tre Cime di Lavaredo. This common part starts in the Val d'Ansiei and ends at Bivio Dogana Vecchia. More precisely, the start lies at Palùs San Marco, the last settlement in the Val d'Ansiei. After about three kilometers the road becomes steeper and the next more than four kilometers are fairly steep (mostly 8-10%). Here the road leads through the forest but occasionally there are views of the impressive mountains. At Bivio Dogana Vecchia we turn left. Now the slope decreases significantly (0-6%) until three kilometers further on an architecturally beautiful bridge across an almost dry riverbed is reached. Here we have a nice view of the impressive Monte Cristallo, situated to the right of the road. After the bridge there is still a short, steep strip (10%) before we get to the pass.